M4 Westbound from Bassaleg / Duffryn – joining at Junction 28 M4, continue westbound on M4 for 3.6 miles. Leave M4 on Junction 29 onto the A48M, continue on A48M for 6.3 miles and take the exit sign posted A4232 towards Cardiff (E)/Caerdydd (dn) Docks/Dociau, when exiting keep in the left hand lane and proceed left after the slip road. Keep left and take exit signed City Centre A4161, Newport Road. Continue through traffic lights and straight over the roundabout then through more two more sets of traffic lights (caution 30mph speed camera at 2nd set). When a third set of traffic lights is visible move to the right lane to turn right at these lights, you will have shops such as Aldi and Carphone Warehouse to your left. Turn right onto Dominion Way and the track will be directly ahead 200 meters, through the gates and into the car park. 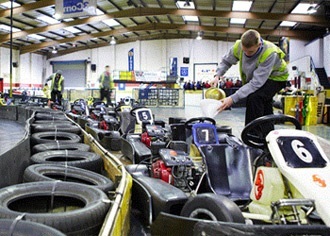 The venue has 6 specific cadet/junior karts. There are conference facilities for 50+.